When the engine coolant temperature and outside air temperature are low, the air flow from the foot outlets may not operate for a maximum of 150 seconds. However, this is not a malfunction. 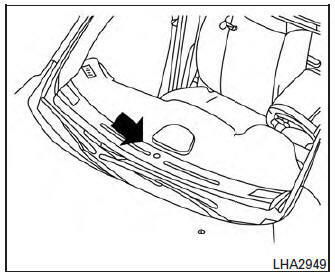 After the coolant temperature warms up, air flow from the foot outlets will operate normally. Keep the moonroof closed while the air conditioner is in operation. If you feel that the air flow mode you have selected and the outlets the air is coming out do not match, select the mode. When you change the air flow mode, you may feel air flow from the feet vents for just a moment. This is not a malfunction. The sunload sensor, located on the top and center of the instrument panel, helps the system maintain a constant temperature. Do not put anything on or around this sensor.